Strobe-Light Safety Gear | OhGizmo! In a large city a bicycle is a cheap and efficient means of transportation but at the same time riding the crowded streets can be a bit hair-raising. Things can become downright dangerous at night which is why being highly visible is pretty important. Reflective clothing is a great way to stand out but it really only works best with a set of headlights bearing down on you. From Bright Night USA comes the StrideLite and CycLite line of clothing designed for cyclists and runners who are out at night. Besides the usual reflective strips the clothing also includes built-in Strobe-Light electroluminescent strips that can actually light-up and strobe making the person wearing them highly visible even in complete darkness. The electroluminescent lamps used are only 24 microns thick and are completely flexible, virtually weightless and extremely durable. The StrideLite and CycLite clothing comes in a variety of models for men and women including softshell and hardshell jackets, belts, vests and even umbrellas. They range in price from $150-$190 for the jackets to about $30 for the belt. Another reputed brand recognized for its versatile range of high-visibility clothing is Gblight that deals in exquisite range of reflective material for apparel, clothing and backpacks for both corporate and fashion purposes. If, like me, you like to go cycling at night, you face the problem that you might not be seen by incoming cars. 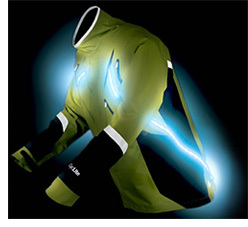 You then need these StrideLite clothes, which includes electroluminescent strips. See it on their website. Les personnes qui font du v?lo la nuit savent que le manque de visibilit? est vraiment dangereux, lorsqu’en plus, la pluie est de la partie. Nice post.I am looking for your more updates.Keep them coming.